Hosted by Power Systems Design, sponsored by Fuji Electric Fuji Electric has been developing the "HPnC" high-current power module to be used with electric railcars and photovoltaic and wind power generation facilities. The chip uses 7th-generation "X-series" technology, enabling it to achieve lower power loss. The package employs an aluminum nitride (AIN) insulating substrate that utilizes a high heat-dissipating member, as well as base materials consisting of magnesium and silicon carbide composite materials (MgSiC). Adopting a laminated structure for the enclosure of the terminal makes the internal inductance decrease to 10nH. Furthermore, ultrasonic terminal welding is used to comply with the RoHS directive. With these technologies, the module achieves a high current density, which is 12% greater than the conventional HPM. 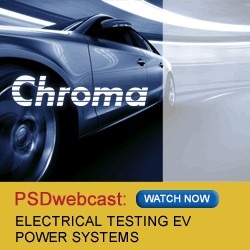 Building on their success of developing the world’s first UL approved SAE J1772 EVSE Communication Protocol Test System, Chroma has been dedicated to improve electric vehicle testing performance by developing and manufacturing automated test equipment for the entire power system of an EV/PHEV. This dedication, for example, has allowed Chroma to lead the industry in the development of new systems designed specifically to test lithium-ion batteries to EV/PHEV standards. As a result, Chroma’s momentum in EV power test development is getting noticed by automotive manufacturers and test labs all over the world. You’re invited. Whether you are validating designs, running functional tests, or verifying electrical safety, we invite you to join this exciting webinar to learn what you should know about electrical testing an EV power system. This webinar will cover testing of the electric vehicle supply equipment (EVSE), off-board battery charger (OFF-BC), on-board battery charger (OBC), and the low voltage DC-DC Converter (LVD2D). After the presentation, we invite you to stick around for the Q&A where we can dive a little deeper into the details. For decades, Fuji Electric has been contributing to the minaturization and cost reduction of inverters by developing smaller, more powerful IGBT modules through innovation and technological advancements. The development of RC-IGBTs helps to achieve both low thermal resistance and high reliability, and Fuji Electric has developed a reverse conducting IGBT (RC-IGBT) for industrial use which integrates an IGBT and freewheeling diode (FWD). When combined with a new package, the end result is reduced thermal resistance and high reliability, and ultimately, miniaturization of the IGBT module and power density improvement. 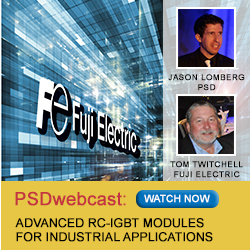 Join this exciting webinar to learn how Fuji Electric was able to overcome the technical challenges associated with combining the IGBT and FWD on a single chip. Who should attend? Engineers and industry professionals interested in learning how to use advanced power semiconductor in power conversion systems, as well as students and other industry professionals who want to understand and apply the latest IGBT technologies. Saving energy and reducing CO2 emissions reductions are among the trends expanding the demand for rapid improvements in IGBT (Insulated Gate Bipolar Transistor) technology, among others. IGBT modules must have increased power densities as well as better temperature management and reliability, realized by applying new, innovative technologies. 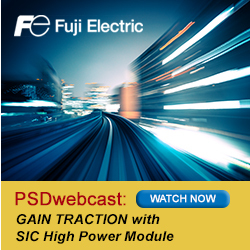 This Webcast will show how a new generation of IGBT modules can contribute to the miniaturization and cost reduction of power conversion systems. 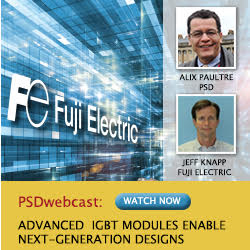 Fuji Electric’s Jeff Knapp will talk about how these new IGBT modules can offer improved performance in a 36% smaller footprint and 10% less inverter power loss, with enhanced power density and efficient thermal management. Learn the technology and the development path that led to these powerfully compact modules, and the research behind reducing the footprint (vs. 6th Generation modules) while delivering up to 75A. Who should attend? Engineers and industry professionals interested in learning how to use advanced power semiconductor in power conversion systems, as well as students and other industry professionals who want to understand and apply the latest IGBT technologies.